Charles V (21 January 1338 – 16 September 1380), called the Wise (French: "le Sage"), was a monarch of the House of Valois who ruled as King of France from 1364 to his death. In 1349, as a young prince, Charles received from his grandfather King Philip VI the province of Dauphiné to rule. This allowed him to bear the title "Dauphin" until his coronation, which led to the integration of the Dauphiné into the crown lands of France. After 1350, all heirs apparent of France bore the title of Dauphin until their coronation. Charles V died in 1380. He was succeeded by his son Charles VI the Mad, whose disastrous reign allowed the English to regain control of large parts of France. Humbert II, Dauphin of Viennois, ruined due to his inability to raise taxes after a crusade in Palestine, and childless after the death of his only son, decided to sell the Dauphiné, which was a fief of the Holy Roman Empire. As neither the pope nor the emperor wanted to buy, the transaction was concluded with Philip VI. Under the Treaty of Romans, the Dauphiné of Viennois was to be held by a son of the future king John the Good. So it was Charles, the eldest son of the latter, who became the first Dauphin. At the age of twelve, he was immediately confronted with the exercise of power while staying in Grenoble (10 December 1349 to March 1350). A few days after his arrival, the people of Grenoble were invited to the Place Notre-Dame, where a platform was erected. Young Charles took his place next to Bishop John of Chissé and received the oath of allegiance of the people. In exchange, he publicly promised to respect the community charter and confirmed the liberties and franchises of Humbert II, which were summed up in a solemn statute before he signed his abdication and granted a last amnesty to all prisoners, except those facing the penalty of death. The control of Dauphiné was valuable to the Kingdom of France, because it occupied the Rhone Valley, a major trade route between the Mediterranean and northern Europe since ancient times, putting them in direct contact with Avignon, a papal territory and diplomatic center of medieval Europe. Despite his young age, the dauphin applied to be recognized by his subjects, interceding to stop a war raging between two vassal families, and gaining experience that was very useful to him. Charles was recalled to Paris at the death of his grandfather Philip VI and participated at the coronation of his father John the Good on 26 September 1350 in Reims. The legitimacy of John the Good, and that of the Valois in general, was not unanimous. His father, Philip VI, had lost all credibility with the disasters of Crecy, Calais, the ravages of the plague, and the monetary changes needed to support the royal finances. The royal clan had to cope with opposition from all sides in the kingdom. King John was a brave warrior but poor ruler who alienated his nobles through arbitrary justice and the elevation of associates considered unworthy. After a three-year break, the Hundred Years' War with England resumed in 1355, with Edward, The Black Prince, leading an English-Gascon army in a violent raid across southwestern France. After checking an English incursion into Normandy, John led an army of about 16,000 men to the south, crossing the Loire in September 1356 with the goal of outflanking the Prince's 8,000 soldiers at Poitiers. Rejecting advice from one captain to surround and starve the Prince, a tactic Edward feared, John attacked the strong enemy position. In the subsequent Battle of Maupertuis (Poitiers), English archery all but annihilated the French cavalry, and John was captured. Charles led a battalion at Poitiers that withdrew early in the struggle; whether the order came from John (as he later claimed), or whether Charles himself ordered the withdrawal, is unclear. The outcome of the battle left many embittered with the nobility. Popular opinion accused the nobles of betraying the king, while Charles and his brothers escaped blame — he was received with honor upon his return to Paris. The Dauphin summoned the Estates-General in October to seek money for the defense of the country. Furious at what they saw as poor management, many of those assembled organized into a body led by Etienne Marcel, the Provost of Merchants (a title roughly equivalent to Mayor of Paris today). Marcel demanded the dismissal of seven royal ministers, their replacement by a Council of 28 made up of nobles, clergy and bourgeois, and the release of Charles the Bad, who had been imprisoned by John for the murder of his constable. The Dauphin refused the demands, dismissed the Estates-General, and left Paris. Charles made a royal progress through the country that summer, winning support from the provinces, and he won Paris back. Marcel, meanwhile, enlisted Charles the Bad, who asserted that his claim to the throne of France was at least as good as that of King Edward III of England, who had used his claim as the pretext for initiating the Hundred Years' War. John's capture gave the English the edge in peace negotiations following the Battle of Poitiers. The King signed a treaty in 1359 that would have ceded most of western France to England and imposed a ruinous ransom of 4 million écus on the country. The Dauphin (backed by his councillors and the Estates General) rejected the treaty, and King Edward used this as an excuse to invade France later that year. Edward reached Reims in December and Paris in March, but Charles forbade his soldiers from direct confrontation with the English, relying on improved municipal fortifications made to Paris by Marcel. He would later rebuild the wall on the Left Bank (Rive gauche), and he built a new wall on the Right Bank (Rive droite) that extended to a new fortification called the Bastille. Edward pillaged and raided the countryside but could not bring the French to a decisive battle, so he eventually agreed to reduce his terms. This non-confrontational strategy would prove extremely beneficial to France during Charles' reign. The Treaty of Brétigny, signed on 8 May 1360, ceded a third of western France (mostly in Aquitaine and Gascony) to the English and lowered the King's ransom to 3 million écus. King John was released the following October. His second son, Louis I of Anjou, took his place as a hostage. 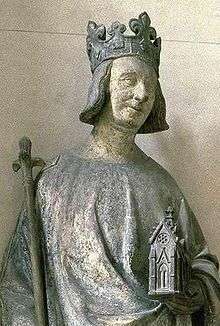 Du Guesclin and his men were able to drive Peter out of Castile in 1365 after the capture of the fortresses of Magallon and Briviesca and the capital Burgos. But the Black Prince, now serving as his father's viceroy in southwestern France, took up Peter's cause. At the Battle of Nájera in April 1367, the English defeated Henry's army. Du Guesclin was captured after a memorable resistance and ransomed by Charles V, who considered him invaluable. The Black Prince, affected by dysentery, soon withdrew his support from Peter. The English army suffered badly during the retreat. Four English soldiers out of five died during the Castillan Campaign. In 1369, du Guesclin renewed the attack against Peter, defeating him at the decisive Battle of Montiel. Henry stabbed the captive Peter to death in du Guesclin's tent, thereby gaining the throne of Castile. 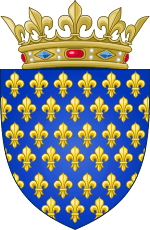 Bertrand was made Duke of Molina, and the Franco-Castillan alliance was sealed. Charles V could now resume the war against England under favorable conditions. After the Castillan campaign, the Black Prince was invalid and heavily in debt. His rule in Gascony became increasingly autocratic. Nobles from Gascony petitioned Charles for aid, and when the Black Prince refused to answer a summons to Paris to answer the charges, Charles judged him disloyal and declared war in May 1369. Legally, Charles had every right to do this; the renunciation of sovereignty by Charles was never made and therefore Gascony was still legally held by the King. Most of the major English leaders were killed in a few months and the Black Prince fled to England, where he died in 1376. By 1374, Charles recovered all of France except Calais and Aquitaine, effectively nullifying the Treaty of Brétigny. The King died on 16 September 1380 and was succeeded by his 12-year-old son, Charles VI. He is buried in the Basilica of St Denis, some five miles north of Paris. 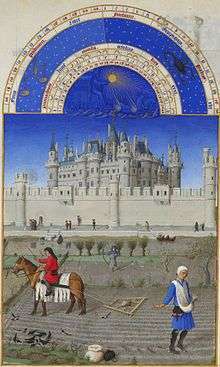 Other important works commissioned for the royal library were the anonymous legal treatise "Songe du Vergier," greatly inspired by the debates of Philip IV's jurists with Boniface VIII, the translations of Raol de Presles, which included St. Augustine's City of God, and the Grandes Chroniques de France edited in 1377 to emphasise the vassalage of Edward III. Joanna (Vincennes, 6 June 1366 – 21 December 1366), interred at Saint Denis Basilica.